If you have lived in the United States in the past 10 years, you would have noticed the rapid change in marijuana policies. Even in states where marijuana is not legal yet, they have seen an increase in citizens wanting it legalized. People are starting to realize the benefits that cannabis can provide them or they see the positive benefits of how it is benefiting others around them. Contrary to what people had been thinking for a long time, liquor stores are not the ones selling marijuana. Dispensaries are starting to open up everywhere and if you’re in a state that has passed medical or recreational marijuana laws, you might be seeing one on every corner. Although many people are opposed to this, it can be a good thing because it will increase competition which increases authenticity along with potency and it can even increase the amount of educated budtenders. Dispensaries are the storefronts that sell marijuana whether it’s recreational or medical. Different states have different laws and there is a difference between the recreational and medical market in most places. Not every dispensary is the same so dispensary accessories vary. For example, some dispensary will have dry herb flowers and concentrates but no edibles or some might have just cannabis products but they won’t carry any glass smoking pipes. One thing to remember is that in the USA, you cannot pay with a credit or debit card. This is because it is still federally illegal so it makes it hard for financial institutions to accept it. All payments will need to be paid with cash. There are usually ATMs for you to use and get cash out. Some things to remember when visiting a dispensary regardless of which type it is, is to be courteous and respectful. For the most part, dispensaries are the same. The main difference between medical and recreational sales is going to be that medical needs a valid doctors recommendation or some sort of certificate that your state requires. You will need to show this and be at least 18 years old in most states. Some states might require you to be 21. One advantage of medical dispensaries is that they don’t charge tax like recreational places. Since medical marijuana may require more education, you will get more attention from your budtender. It is their job to help you pick the right product for your ailment. Recreational dispensaries require the customer to be 18 or 21 years or older. To get in, you just need to show a valid ID. All states open to recreational sales have different laws. Some might require you to have a valid ID from that state which means you will have to be a resident. They also will have different possession laws. There are a bit more stringent laws on the recreational sides. In Oregon, you can only sell flower dry herbs. One of the down sides is that recreational costs more to buy because of the high taxes placed on it. The taxes do go towards the states education and roads along with other systems. Marijuana packaging comes in a plethora of different ways and there are packaging for a lot of different products. They used to be more colorful and funky but as states are legalizing, there are more laws that stop them from being out there. Most of the main products that are sold in dispensaries are either dry herb flowers or concentrates. Both of those require containers or some sort of jars. They may vary in size and design. Container for flowers are smell proof and airtight. Not only is this going to be ideal for the buyer because the smell won’t get out when they take it home but you also want to keep it air tight. Flowers tend to dry up when they are pulled from their stem and left out. Most people who smoke tend to like fresh herbs because they burn slower in a joint or blunt. However, vaping dry herbs gives you the edge of heating up quicker since you don’t burn it. Containers for dry herb vapes are usually called pop top vials. For joints and blunts, they are called doob tubes. Concentrate waxes are a bit different. There are so many different kinds that they require different ways to pack them. The one that is most used are the clear round jars that are screwed onto each other. They are small and generally hold up to 2 grams of crumble wax. Shatter is a bit different and it requires parchment paper. When it’s made from the extraction process, it is blasted onto the parchment paper direct. Bags for cannabis dispensaries are used for a ton of reasons. You can either get bags that are used to place your dry herbs in or use the bag that places your pop top vial in. They are important upon your exit. There are exit bags that look almost identical to pharmacy prescription bags. These specific bags are used because they are generally child proof and airtight. Not only do they help prevent kids from opening it up but they also add an extra layer of keeping it fresh. When you purchase something from a dispensary, you generally get a label slapped onto your container. This label is a compliant label which explains what is in your jar. If its flowers in a pop top, you will generally get a stick which has an indication of where it’s a hybrid, sativa or indica along with the strain name and the weight. 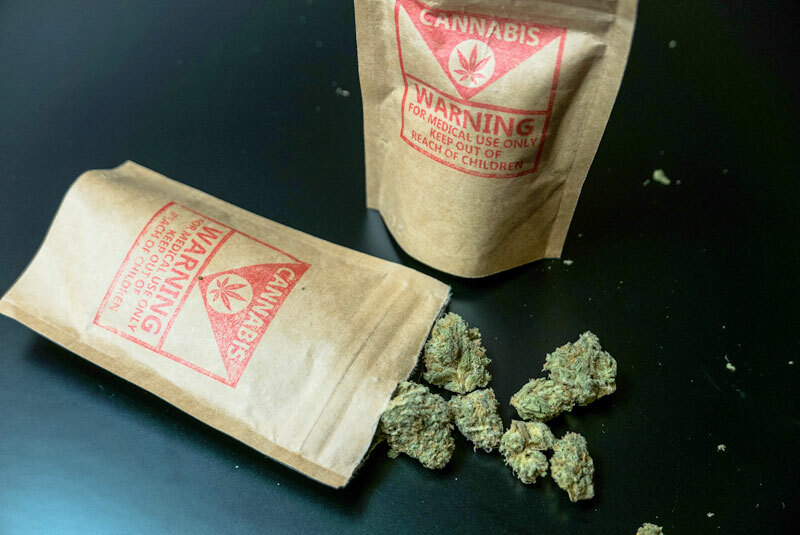 Marijuana packaging and labeling varies from dispensary to dispensary and state to state, however, you’re going to find most follow a pretty standard protocol. Whether it’s to keep the cannabis products fresh or protect a child from opening a container to access the contents, the importance of packaging and labeling is critical for both the dispensary and consumer.